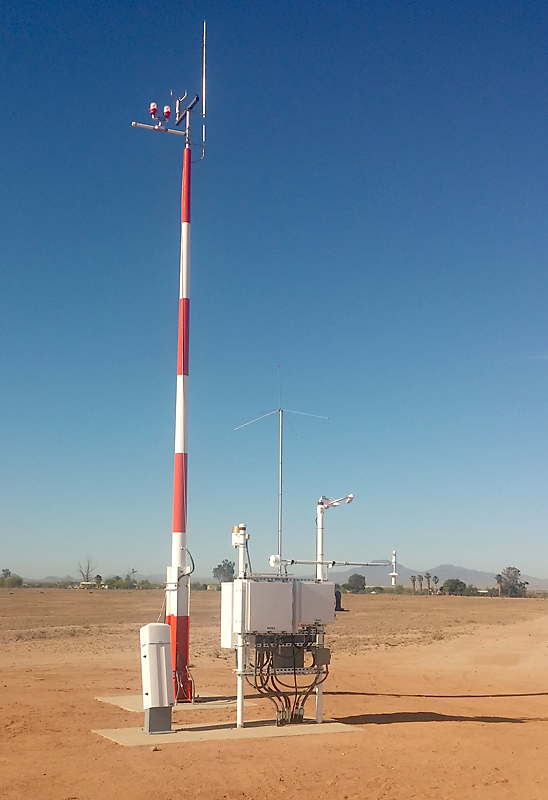 commissioning process today on its AWOS 3P (automated weather observing system) at the Ak-Chin Regional Airport. The AWOS is now broadcasting live weather data on 126.900 MHz. It can also be contacted by phone at 520-568-7704. This AWOS is the latest offering from Vaisala with all digital sensors and processors that report altimeter setting, wind data, temperature, dew point, density altitude, visibility, cloud/ceiling data, and has a precipitation identification sensor. It is only the third of its kind to be installed in the country. 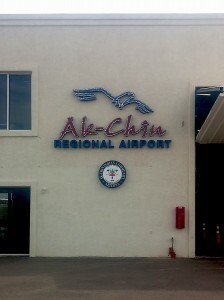 The AWOS installation at Ak-Chin Regional is just one of the many ongoing improvements the airport has undergone since Ak-Chin purchased the property in 2006 and began its series of renovations in 2011. Since then, the runway and taxiway have been crack sealed, seal coated, and remarked; a new beacon, wind cone, and segmented circle were installed; the terminal building was upgraded and the self-serve fuel system was reactivated. 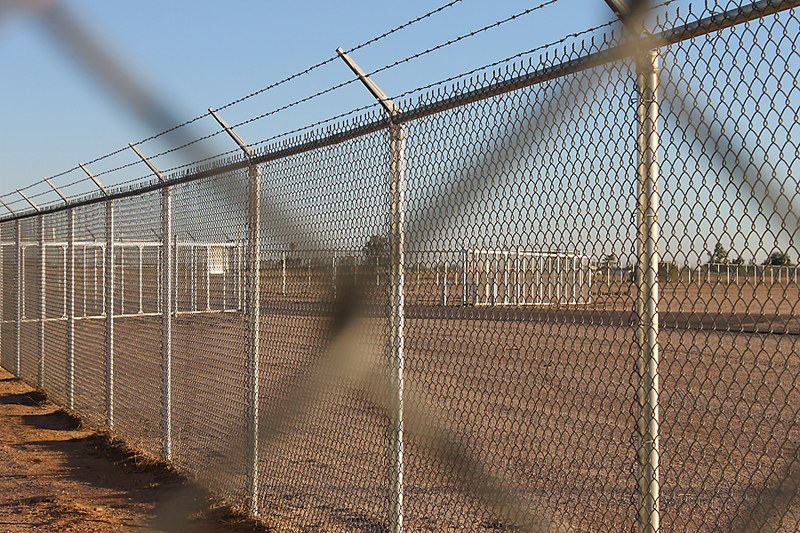 The most recent improvements included the installation of new signage, perimeter fencing, and runway lighting. Watch for more announcements about additional improvements to come. 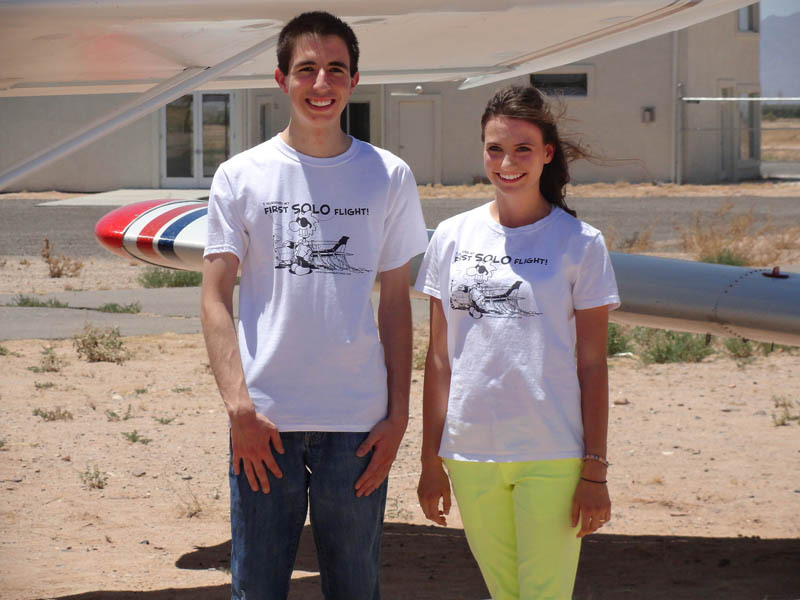 MARICOPA, Ariz. (July 12, 2013) – Spirits were flying high on the weekend of June 22-23, when 16-year-olds, Samantha Anderson and James Chavez, completed their first solo flights out of Ak-Chin Regional Airport. These events not only celebrated the achievements of these young pilots, but also marked the first female and male pilots to solo out of the regional airport. In order to solo, the students had to demonstrate proficiency in flight operations such as maneuvers, stalls, steep turns, climbs, descends, radio work, touch and go landing/take-offs. 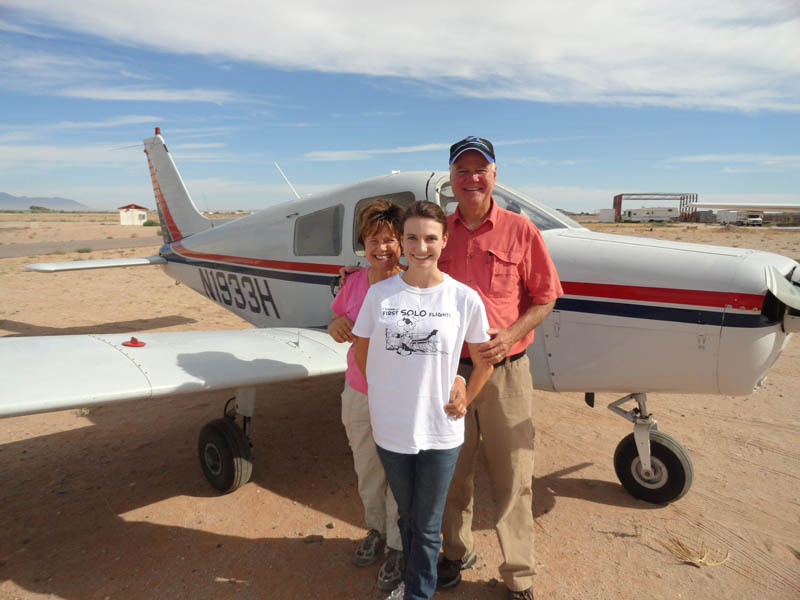 Both Samantha and James were able to accomplish this in 15 hours of flight lessons with the Desert Aero Club, a group of instructors and pilots founded by Andy Estes and Kevin Gallagher to share their love of classic aviation. Located adjacent to the airport, the Desert Aero Club specializes in classic aircraft rental and flight instruction in traditional stick and rudder as well as tricycle gear aircraft. The instructors in this case were none other than Samantha’s dad, Club member and professional airline captain, Sherman Anderson, and Andy Estes, certificated flight instructor and owner of Desert Rat Aviation, which specializes in classic aircraft restoration. As part of their training, Samantha and James mastered both the stick and rudder operation of the Aeronca 7EC Champ tail dragger and tricycle gear of the Cherokee 140. After the young pilots successfully completed their flights, they participated in a venerable aviation ritual in which the back of their shirts are inscribed with the details of their first solo flights and then, the backs of the shirts are ceremoniously cut off. The tradition comes from the days when the student sat in the front seat with the instructor behind in tandem rather than side-by-side. Since there were usually no radios in those early days, the instructor would tug on the student pilot’s shirt tail to get his attention, and then yell in his ear. 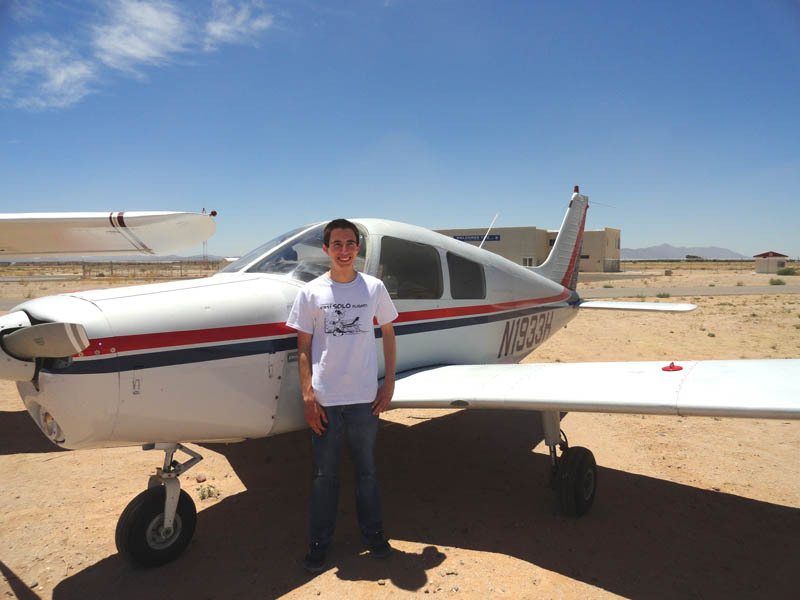 When a student successfully completed his first solo flight, it indicated that the student could fly without an instructor and therefore, no longer needed a shirt tail. Subsequently, the proud instructor would cut it off and display it as a trophy as a sign of the instructor’s new confidence in his student. With their first solo flights now successfully completed, the new young pilots will begin work on cross-country flight training. Ak-Chin Regional Airport joins Desert Aero Club in wishing Samantha and James clear skies ahead in their new homes in the sky! 16-year-old, Samantha Anderson, is the first female pilot to solo out of Ak-Chin Regional Airport. She took her first solo flight on June 22, 2013. Samantha Anderson is the daughter of Sherry and Sherman Anderson. A love for flying runs in the family, her mom is a First Officer for United Airlines and her dad is a pilot for US Airways. Along with Andy Estes of Desert Aero Club, her dad was also Samantha’s flight instructor. 16-year-old, James Chavez, is the first male pilot to solo out of Ak-Chin Regional Airport. He took his first solo flight on June 23, 2013. 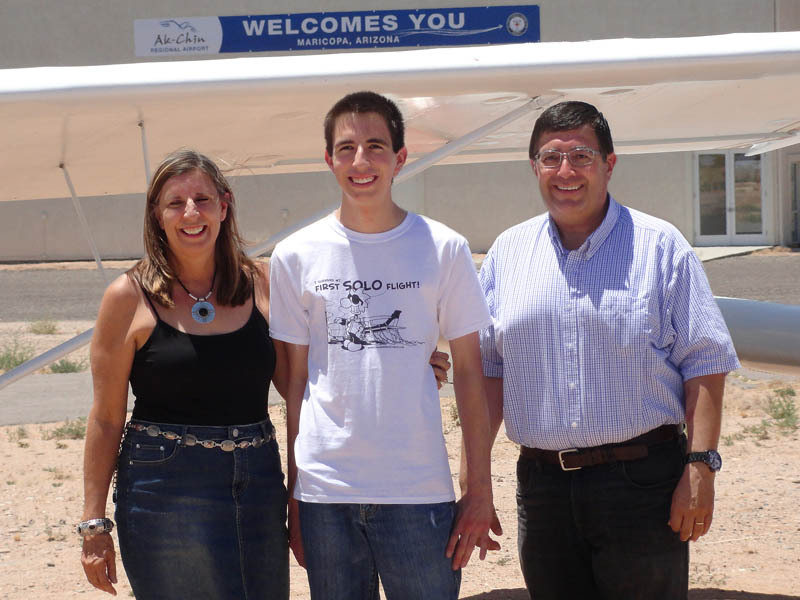 James Chavez, son of Ed & Debbie Chavez, took his first solo flight on June 23, 2013. 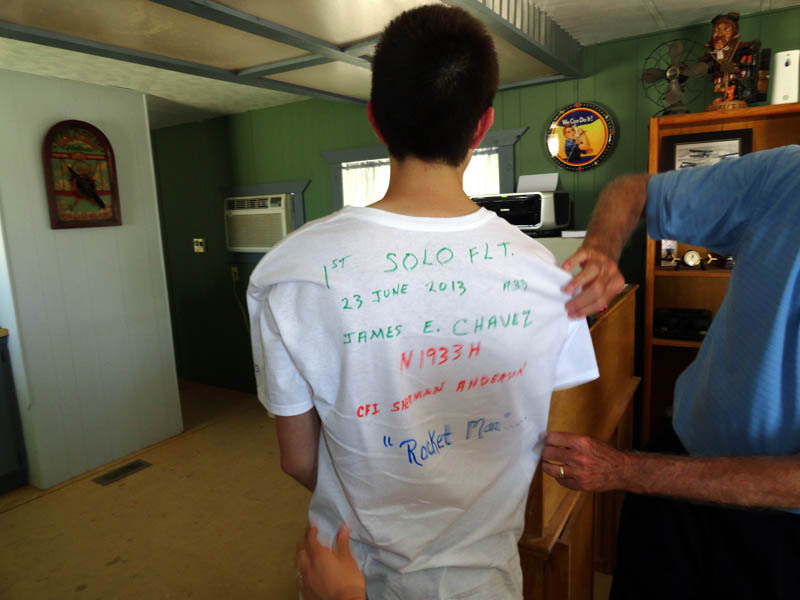 A venerable aviation ritual: inscribing the details of the new pilot’s first solo flight on the back of his shirt. 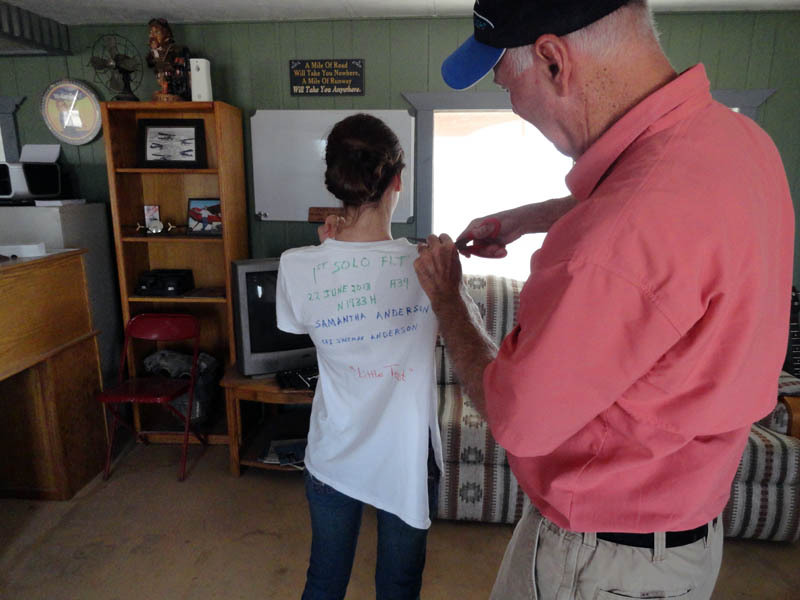 A venerable aviation ritual: After inscribing the back of her shirt with the details of her first solo flight, the back of the shirt is cut off by the proud instructor (in Samantha’s case, her dad, Sherman Anderson). With their first solo flights successfully completed, James and Samantha will now start working on cross-country flight training.